If you mixed Canabalt's minimalist single-button action with the artwork found on a 12-year-old girl's Trapper Keeper, you might end up with something close to Robot Unicorn Attack. As you gallop rightward across the pastel fantasy landscape, you must leap over chasms and avoid running into walls for as long as you can to build your score. For even more points, you can collect floating faeries or plow through star blocks with your dash ability. It's pretty much the gayest thing ever, but you can take comfort in the fact that there are robots and explosions if you start to feel threatened. What's surprising is how much care clearly went into realizing this absurd premise. The graphics are pretty impressive for a Flash game, particularly the unicorn's animations, which are incredibly fluid and realistic. 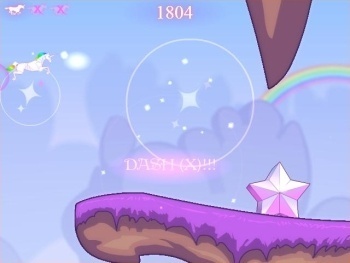 The developers' were obviously committed to the game's warped fantasy aesthetic - if the rainbows that trail from your unicorn mid-leap don't bring a smile to your face, then the dolphins that skip across the screen when you reach a high score surely will. And the soundtrack from synth-pop duo Erasure fits the game's atmosphere to a T. It's not the deepest browser game out there (although, to its credit, it boasts twice as many buttons as Canabalt), but it's pretty damn fun nonetheless.